Originally printed on January 17, 2019 in the Gravesend Reporter. 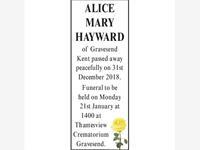 ALICE MARY HAYWARD of Gravesend Kent passed away Peacefully on 31st December 2018. 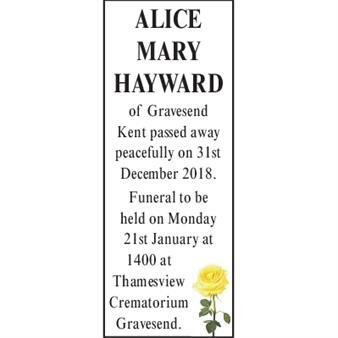 Funeral to be held on Monday 21st January at 1400 at Thamesview Crematorium Gravesend.